Thanks to AToMR Tours, we've got a review of the new YA contemporary, Canary, by Rachele Alpine . Keep scrolling to check out our review and then enter to win a copy for yourself! Visit the other tour stops for reviews, excerpts, interviews, and more! I've actually had this book on my radar for a long time, but somehow it just kept slipping further and further down the list of books I had to read, so I was really excited when the opportunity to join this tour came up. 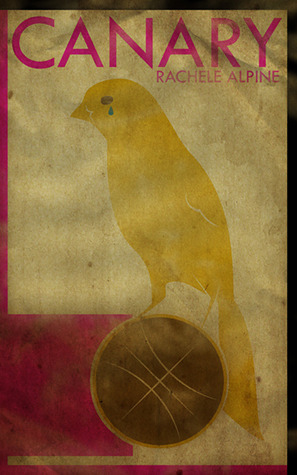 Canary didn't disappoint, but it also broke my heart. I'll admit off the bat that there were times when I was really annoyed at everyone in this story. You want everyone to see what's happening right in front of them, and you want them to do something to stop it, but everyone is too wrapped up in their own drama to care. As an adult, my mind boggles at some of Kate's choices, but I think teenaged me could have made some of the same decisions. Imagine being at a new school where you're instantly popular and you suddenly have access to a whole new world of friends, opportunities, privileges, parties. People are paying attention to you who never would have given you the time of day in your old life. You get so blinded by this new, exclusive world that you're given access to that you miss some pretty obvious warning signs that your friends aren't really your friends. As adults I think a lot of us like to reflect back and think we'd be above that, but, man, as an unpopular kid who sometimes wanted to know what it was like to have been in the "in" crowd, I could see me being just as misled as Kate. Kate's assault at a party is the last straw in many ways. It finally forces her to step back and examine the people she thought were her friends, and look at who is supporting her and who is throwing her under the bus. It broke my heart to see what Kate had to go through after people found out about the assault. Kate's father, someone who should have supported her 100%, washes his hands of the matter and pretends it didn't happen. It was gut-wrenching to read Kate's confrontations with her dad; I couldn't imagine being left out to dry, pretty much, by either of my parents in a situation like that. Most of the people in this story are pretty horrible: Kate's crappy friends, Kate's crappy boyfriend, Kate's crappy withdrawn dad. Kate's brother comes off as kind of crappy at first, too, but as the story goes on, he gets a little more depth, which follows a nice arc along with Kate's own character growth. Like I said, you just want to sit Kate down and tell her these people don't care about her, but it's almost something she had to learn for herself -- and unfortunately she learned it in a very awful, traumatic way. One of the only things that really disappointed me about the book was a side plot about a character joining the military. The book takes a very anti-military stance (as in, the military is just for boys who couldn't make it to college and had nowhere else to go). I'm not from a military family or anything, but I really felt like our soldiers deserve more respect than that and it made me sad to see that being a plot point. Regardless of why one goes into the military, these are men and women making sacrifices for our country that most of the rest of us could never fathom doing. The storyline's eventually resolved in a good way, but that whole line of reasoning made me uncomfortable. Though the story is dealing with a sexual assault, there's nothing too graphic written and it is handled very sensitively. Also, there's a lot of making out, drinking, and innuendo, as well as bullying, name-calling, etc. Because of the subject matter, including bullying, sexting, and assault, this book could be triggering for some readers. Sound interesting? Then don't miss this giveaway! It's international, so everyone can enter. Check it out and enter to win! Nice review! I know lots of people have liked it, but then a good portion hasn't. But this review definitely makes me want to consider it! I think it's definitely worth a read! There were things about it that frustrated me, and some of the plot points were kind of predictable, especially if you read a lot of contemporary/"issues" sort of novels, but it was really well written. I hope you give it a shot! I really enjoyed your review. Sounds like a good and interesting read. Putting it on my TBR list.